Easter 2018 in Barcelona is full of things to do and see, and we are going to list some of them and give you a bit of information so you can make the most of our visit to the city during this time of the year. This article can also be useful if you are already living in Barcelona, since you will find several proposals that might be interesting for you. Let’s start! First of all, you need to know that Easter holidays 2018 fall between March 25 and April 2. In Catalonia, Easter, here known as Holly Week, starts with the Palm Sunday and finishes on Easter Monday; while in Spain it finishes on Easter Sunday (and Maundy Thursday is a public holiday). Good Friday and Easter Monday are public holidays in Barcelona, so most shops will be closed. Spain is a secular country but it’s still very rooted in its Christian traditions, so the Holly Week is celebrated in most cities, even though some of them don’t really do any religious celebrations or references. In fact, Easter processions in Barcelona are not the biggest compared to other cities like Sevilla -probably because the Catalan capital is a really cosmopolitan city-, but there are still a few that are worth mentioning. Good Friday might be the best day to see some processions in Barcelona. Sant Jaume Church, the Barcelona Cathedral and Santa Maria del Mar are the starting points of the most important processions. If you want to see the procession in the morning, then you have to go to Santa Maria del Mar at 9:30am. If you prefer to do it in the evening, then you will have to choose between Sant Jaume (7pm) and the Cathedral (6:30pm). 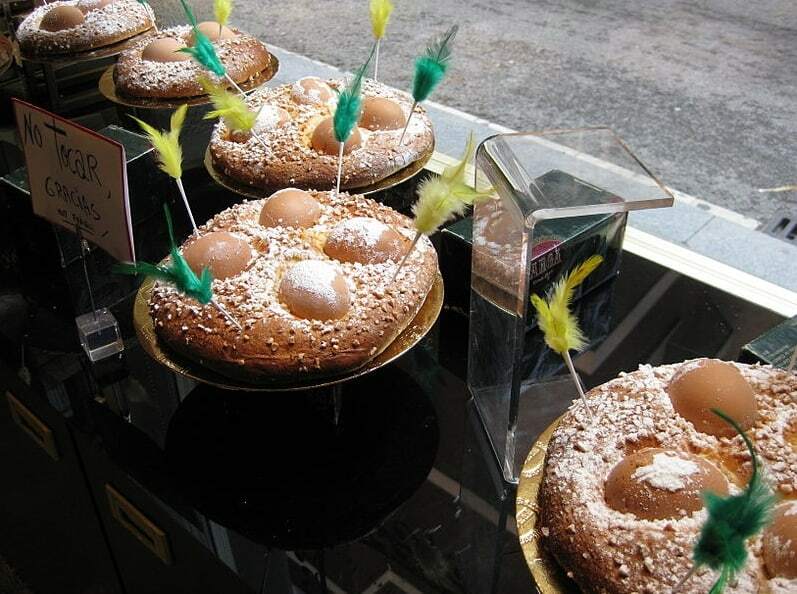 Easter Monday is known in Catalonia as “Dia de la Mona”. Godparents have to give a “Mona de Pasqua” to their godchildren. It is an Easter sweet that has evolved throughout the years: from an egg and sugar based ring-shaped cake with boiled eggs on top to a modern cake with chocolate sculptures on top and all kinds of figures around. We recommend you to visit some bakeries or cake shops to see and taste some. If you are not really into traditional or religious activities, there also a lot of possibilities for you. If you have never been to Barcelona before, your weekly plan is probably already full with activities such as: go see the Sagrada Familia, visit La Pedrera and casa Batlló, go to the beach or go shopping around Passeig de Gracia. We understand it and we would totally do the same plans. Just keep in mind that Barcelona is one of the most visited cities in Europe and you will always find many people in the top locations of the city, such as museums and emblematic monuments or buildings. This will be even more noticeable during summer, Christmas and Easter, so if you are visiting the city or planning on seeing any of the most popular locations, we recommend you to plan ahead. However, if you have already been to Barcelona and seen the most emblematic locations, you can spend your Easter holidays getting to know some less popular but equally beautiful and interesting locations of our city. Also, it will already be spring in barcelona, so the weather and the temperature will be quite nice and great to do some outdoors activities. If you are looking for some great views of the city we have two options for you: the Bunkers del Carmel at Turó de la Rovira (Rovira’s Hill) and the Port Cable Car that will take you to Montjuïc. The first option, due to its location, will probably be less crowded but it will take you a bit longer to get there (by public transport, bike or car) and you will have to walk up the hill a little bit. But it’s worth it. Its surroundings are heritage of the city and you will have 360º views of Barcelona (for free) from the top. If you prefer to take the cable car -which is good fun- and have a glass of wine while contemplating the sea, then Montjuïc is the right option for you. The first time you visited the city, you probably didn’t have time to get lost in Barcelona’s Gothic Quarter streets, and it is a must. Tiny hidden squares and corners, beautiful buildings, special shops and great restaurants. And afterwards, you can relax and sunbathe in Parc de la Ciutadella. A visit to the Recinte Modernista de Sant Pau (Art Noveau Site) is also mandatory (if you didn’t go on your first visit). It is work of Lluís Domènech i Montaner, one of the most important architects of Modernisme. Whatever you choose to do, if you want to live the city like a local and feel at home, the best you can do is book one of our apartments in Barcelona. Diada de Sant Jordi – what is it all about?